If the joint on one of your toes, usually the toe next to the big toe or the smallest toe, points upward rather than lying flat, you might have a Hammer toe. The condition is actually a deformity that happens when one of the toe muscles becomes weak and puts pressure on the toe?s tendons and joints. This pressure forces the toe to become misshapen and stick up at the joint. Also, there?s frequently a corn or callus on top of the deformed toe. This outgrowth can cause pain when it rubs against the shoe. More often than not, wearing shoes that do not fit a person well for too long may actually cause hammer toes. Wearing shoes that are too narrow or too tight for the person for extended periods of time may eventually take a toll on the person’s feet. The same is true for women who like wearing high-heeled shoes with narrow toe boxes. The hammertoes exam may reveal a toe in which the near bone of the toe (proximal phalanx) is angled upward and the middle bone of the toe points in the opposite direction (plantar flexed). Toes may appear crooked or rotated. The involved joint may be painful when moved, or stiff. There may be areas of thickened skin (corns or calluses) on top of or between the toes, a callus may also be observed at the tip of the affected toe beneath the toenail. An attempt to passively correct the deformity will help elucidate the best treatment option as the examiner determines whether the toe is still flexible or not. It is advisable to assess palpable pulses, since their presence is associated with a good prognosis for healing after surgery. X-rays will demonstrate the contractures of the involved joints, as well as possible arthritic changes and bone enlargements (exostoses, spurs). X-rays of the involved foot are usually performed in a weight-bearing position. wear sensible shoes. Here are some tips. Most people have one foot that’s bigger than the other. Fit your shoes to the bigger foot. Buy your shoes at the end of the day as your feet tend to swell a bit and you will get a better sense of fit. When you buy your shoes, wear the sock that you will be using when wearing that shoe – wear a sports sock when buyingtrainers, for example. As you get older, your feet get bigger. Get your feet measured every time you buy shoes. Don’t go by shoe sizes. Shoe sizes vary among manufacturers; a shoe is the right size only when it fits comfortably. The ball of your foot should fit into the widest part of the shoe. A shoe should be sturdy so that it only bends in the ball of the foot, exactly where your big toes bend. Any shoe that can be bent anywhere along the sole or twisted side to side is generally too flimsy. There should be at least 1.5 cm between the tip of your longest toe and the front of the shoe. Never buy shoes that feel tight and expect them to stretch with wearing. If you have prominent areas on your feet such as hammer toes and bunions, avoid shoes with a lot of stitching or multiple pieces of fabric, as these stitched areas tend not to stretch to accommodate various toe deformities. Your shoes shouldn’t ride up and down on your heel as you walk. The higher the heel, the less safe the shoe. Check children’s shoes regularly. Maintain good flexibility through stretching exercises. Avoid excessive running on hard surfaces. Use quality, well-fitting shoes with firm support and a shock-absorbent sole. A steroid (cortisone) injection is sometimes tried if your pain remains bad despite the above ‘conservative’ measures. It may relieve the pain in some people for several weeks but does not always cure the problem. It is not always successful and may be sore to have done. Steroids work by reducing inflammation. Sometimes two or three injections are tried over a period of weeks if the first is not successful. Steroid injections do carry some risks, including (rarely) tearing (rupture) of the plantar fascia. Extracorporeal shock-wave therapy. In extracorporeal shock-wave therapy, a machine is used to deliver high-energy sound waves through your skin to the painful area on your foot. It is not known exactly how it works, but it is thought that it might stimulate healing of your plantar fascia. One or more sessions of treatment may be needed. This procedure appears to be safe but it is uncertain how well it works. This is mostly because of a lack of large, well-designed clinical trials. You should have a full discussion with your doctor about the potential benefits and risks. In studies, most people who have had extracorporeal shock-wave therapy have little in the way of problems. However, possible problems that can occur include pain during treatment, skin reddening, and swelling of your foot or bruising. Another theoretical problem could include the condition getting worse because of rupture of your plantar fascia or damage to the tissues in your foot. 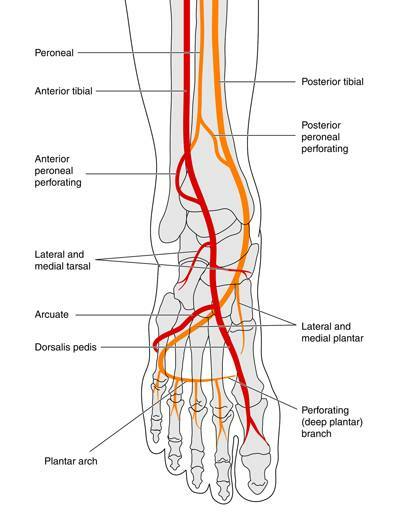 More research into extracorporeal shock-wave therapy for plantar fasciitis is needed. Other treatments. Various studies and trials have been carried out looking at other possible treatments for plantar fasciitis. Such treatments include injection with botulinum toxin and treatment of the plantar fascia with radiotherapy. These treatments may not be widely available. Some people benefit from wearing a special splint overnight to keep their Achilles tendon and plantar fascia slightly stretched. The aim is to prevent the plantar fascia from tightening up overnight. In very difficult cases, sometimes a plaster cast or a removable walking brace is put on the lower leg. This provides rest, protection, cushioning and slight stretching of the plantar fascia and Achilles tendon. However, the evidence for the use of splint treatment of plantar fasciitis is limited.